It’s now even easier to view your most important numbers at a glance. Today we’re introducing a new view of your stats. Insights give you instant access to your all-time numbers, including posts, views, and visitors. Dig deeper into your stats to make the most of your site. Have you ever wondered what times of day or days of the week you have the most visitors? Insights has you covered! Of course, one of the best things that you can do to improve the numbers on your Insights page is to post more frequently. You’ll find a visualization of your posting trends right at the top of the page — one glance, and you can see how many posts you publish when. The stats that you’re used to seeing haven’t gone away. We’ve moved the Comments, Followers, Tags & Categories, and Publicize sections to the Insights page. Everything else is right where it was before, you’re still able to view the other modules by day, week, month, or year — just select the period you’d like to view at the top of the stats page. We love that you’re passionate about your stats, and that you share that passion with us. These new features wouldn’t exist without your valuable feedback! We welcome your feedback on the forums. If you area self-seeking blogger then by all means, I post for MY benefit not anyone else’s, so numbers don’t mean anything to me. People will read it or not, once you start chasing popularity then you lose the point. Any idea if this will be released in Mobile App version of WP? The Insights page can be viewed on mobile today in your browser. Stay tuned for announcements about Insights on our iOS and Android apps. Wow, this insights page is about as convoluted and not user-friendly as is the stupid “beep beep boop” page for posting. It should not be the default page for “my sites.” And that’s not just a reactionary knee-jerk to change. As many things as I like about WordPress, it seems that every supposed improvement has major problems. We appreciate your feedback. We have many different users with different needs, and we try our best to balance all of them to bring you the best service possible. I’d love to hear what it is you find confusing about the Insights page so that we can try to address it. Re-reading my comment, it seems unnecessarily harsh, and for that I apologize. Here are my concerns with the “insights” view (which, interestingly, stopped being the default “stats” page later in the day): The graphs (are they even graphs?) at the top of the page – just a collection of interestingly-colored squares, to my eye – are cryptic and unreadable at a glance. Honestly, even after studying them I don’t know what they’re supposed to mean. The two large stats directly underneath are slightly interesting, but only in a passing way. I don’t check my stats page all the time, but when I do, the things I want to know aren’t all on the new “insights” page (I’m always particularly interested in the world map) or else I have to scroll way down to see them. But as long as “daily” continues to be my default stats page, I can just ignore the “insights” page and it’s all good. Thanks again for your feedback. The squares at the top of the page represent your posting activity. The boxes that are darker represent days you post more frequently, and the lighter boxes represent days you post less frequently. why only most popular day and time? I just noticed this new feature now and I love it! I’m a bit of a nerd for stats and I’ve been trying to figure out the best time to post for a while, thank you! Delightful! What a neat view. But I wonder if the default view could be user configurable, as I prefer to see the Days view by default. Thanks for constantly improving WordPress! When I logged onto my blog this morning to check out my stats, I saw this lovely little gift waiting more me. I loved the insight and ability to see my stats in a new light. Keep on sending us these little bits of love! Can I have this on WordPress.org? The statistic of WordPress.com – is the best statistic ever. But now I have stand alone blog, so maybe you can create a plugin with this statistic? If you install Jetpack and enable the Stats module, you’ll be able to view these stats on WordPress.com for your .org blog. Would also be interesting to see the most popular posting hour/day. What I would like to know is why did you simultaneously introduce the ‘new view of the stats’ while trashing the old stats page? I had just voted for the umpteenth time on why I loved the old stats page. I now have to open another window to view what I was originally viewing in the same window. I understand that you are trying to cater to those with smartphones, but why leave those of us with a pc in the dust? I’d love to hear your feedback about what you feel is missing from the newer version of the stats page, and why you prefer the old version. Thanks God, I found that old stats page. Is it some new idea to create quests for old users wanting to find a normal stats page? Why I should bookmark something? Why you can’t make a tab or link for that page? Can you make it “Site Stats” tab within the “WP Admin” section? I have to think that WP has three different stats pages now. One – the most visible and obtrusive – for mobile users. The second – “Site Stats” tab within the “WP Admin” section – a very strange and uncomplete page. The third – a normal old stats page which had to be bookmarked now. WP, I don’t understand and recognize you. I was able to see it for myself this afternoon. It was a very interesting feature. I plan on using it many times in the future. I liked the view where I could see year over year, averages. I specifically liked being able to compare previous years by month, and the weekly , monthly, yearly averages. Can we still access that data? My problem is that I don’t believe that your basic statistics are accurate for my blog. Often the number of visitors listed is less than the number of home page/archives views. That does not make sense. For example, right now the number of visitors is listed as 3 and home page views as 12, and total views as 20. Moreover, since a visitor who goes to my home page can scroll down and view any number of other posts, the views statistic is unreliable as well. I do like to know the home countries of my visitors, since that information tells me something about the universal appeal of golf and golf poetry, the subject matter of my blog. I’m sure others will welcome the more finely-tuned data. I would just like to believe in the accuracy of the most basic data you provide. Sweeet, love that feature, many thanks and keep up the fantastic work WordPress Team!!! Overall, the old stats design/layout was better on the brain from a cognitive stand point. In other words, there’s more strain on the brain with the new layout. Nevertheless, I appreciate WordPress for always working towards trying to keep up with the ever changing technology and attempting to improve. How do I access insights? The old stats page gave you a way to compare your monthly stats year by year. My stats peak during the track and cross country seasons, and with the old format I can see how my May stats compare to the same month in previous years. Thanks for the link to the old stats page. It is bookmarked. I too prefer the old stats page for reasons of ease of use and clarity. That said, I went and looked at the new Insights. I post five days a week, Monday through Friday and always right around 8am. So why is it showing lots of days with more than one post? Not sure this is going to help me much since I am so regular about my posting and these stats seem off. This is a really great insights page about the future of wordpress. There is much to be learned from just looking at stats in order to make a blog become more noticed. This is interesting, but I would like to know how to interpret that multiple squares graph on the top of Insights, in Posting Activity. I understand the darker squares mean the most activity and the ligher the less. But how do I read the squares lines? are those weeks by column, by line? I think it would be better to add this info to the graph. Thanks for the feedback. Sorry that it’s a bit difficult to read. Each column is a week, Monday – Sunday. The first row is Monday, the second row is Tuesday, and so on. In the example above, what does a best time of 8:00 am mean ? Or some other time ? Thanks. 8:00 am means the hour between 8:00 am and 9:00 am. That’s in comparison with all other hours of the day (starting at the top of each hour). I like the new stats but is it still possible to find the averge views per week or month? I liked the summary section on the old stats page very much for that reason. I really appreciate this feature, as I’ve been trying to figure out which is the best day to post on. Thanks for making it easier for me. Useful as it might be, i would Not like it as the default page at the start. I prefer what i see now but with the option to look at it when needed. Thanks for the Improvements, i have noticed some new Themes with Larger Font and i am very pleased and so are my Eyes. I saw this a little while back. I really like it! It’s very good at summarizing the parts I really want to know. Thanks for keeping on improving as you do! I have Jetpack Site States enabled on WordPress on a self-hosted blog and don’t see the new stats. Do I have to deactivate it and reactivate it or something? Thanks. I liked it the other way where it showed me counties that were reading my post which has been replaced by this. I like it. It looks very smooth. I feel there is one thing missing though. I would love to be able to see what happened “this time last year”. And preferably three years back. Great suggestion. Thanks for your feedback. At last, a confirmation of my blog’s profound unpopularity! Isn’t May an F minor augmented? (Just a little joke for those into guitar tablature.) Seriously, I don’t mind more stats as long as the default view is the “Days” view. I DO mind some stats being removed from “Days” and placed on “Insights.” It’s not an improvement to have to look on two pages to see the stats I formerly got on one. Please revert. I also mind that you’ve taken away the convenient link to the old stats page. This is like taking away the convenient link to the classic editor. It means more bookmarking and clicking to use the basic features that many people like and are accustomed to. Please revert. I have a 3-part series on “Was Picasso Spiritual?” and a 5-part series on “The ACLU and Religious Freedom.” On the old stats page, the full post titles are displayed and I can see at a glance how many views each post got. If I mouse over the titles, I can also see the URLs in my browser. But on the new stats page, the post titles are shortened and (for some mysterious reason) fade into white space. So I only see “The ACLU and Religious Free” and then the text fades out. I can’t see which part number. Mousing over the titles also doesn’t work. I have to instead remember to mouse over the icons to the RIGHT of the titles. To me, it’s just basic design sense that you give people a readable list of post titles, and if they’re formatted to look like links, then mousing over them should show the URL. Often UX design goes through three phases: the early phase, where it’s deficient; the middle phase, where it’s just about right; and the later phase, where programmers start adding all kinds of gimmicks that get in the way of basic usability in order to justify their salaries. Sadly, we seem to be in the later phase, where gimmicks are foisted on end users, and links to preferred options are removed from the relevant menus. No matter how chirpy the PR language used to announce such changes, some people will sense a decline in usability. What time zone do the popularity statistics relate to? I have noticed a discrepancies between this view, the admin view and me in the past. Thanks for this feature. I do not see a visualization of my postings at the top of the page. As I missing something? Thanks! Because of the smaller size, the visualization of posting activity doesn’t currently show up at the top of the page on mobile, but we’re working on making it available on all devices. Are you using a mobile device? If not, what browser are you using? I hate that it only goes back 11 months!! I want to compare year over year!! Wouldn’t that make sense??? When you you say 8 am do you mean MY TIME here on the west coast. The time for most popular hour is adjusted to the timezone of your blog. I appreciate that ya’ll are always working hard on ways to make the site better. I know how hard it must be to implement changes when folks tend to like what they are used to. Is the end goal to have all the admin “site stuff” accessible from one page at some point? We’re all getting lazier with time and the less clicks the better. We are the generation that impatiently taps our foot in front of the microwave, you know. ;p Oh and thanks for the link at the bottom of my site page to tell me where everything had vanished away to. 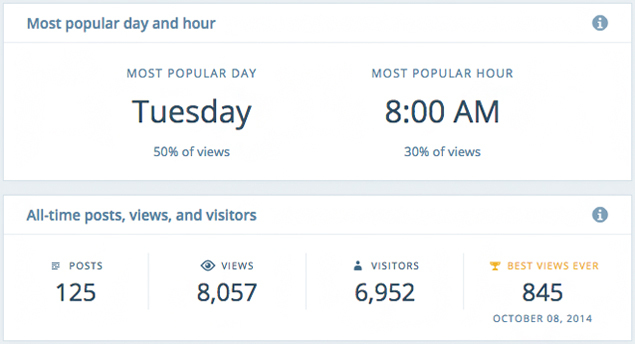 The new insights page is a one small step for WordPress, a huge leap backwards in usability. I can not imagine the person for whom this is optimized. The huge space devoted to a small column of icons on the left? What are they supposed to mean? The numbers part of the statistics is fine I guess, but what about the crunchy stuff, referrers etc.? You can only see Today’s details, which is less then useless when you are looking for hard data. But please roll this back. Thank you. I really miss being able to see where my viewers have come from (both in terms of other websites, and in terms of geography). I miss the world map! All this information is still available. Toward the top of the page, there is a bar of tabs or filters, labeled: Insights, Day, Week, Month, and Year — just click on one of the time periods to see referrers and country views. OK, so I see some of this as good, but I need a very simple plain page like the summary. I get so frustrated that I can’t find that right now. It was there, then it was gone, then it was back now it is gone again. Will it ever come back or am I just going to have to guess????? I do like the insights page. If you are looking for other things people might be interested in, a way to work on posts while off line would be a great addition; something along the lines of LiveWriter yet part of WordPress. One cant get good stats if they cant post. Super handy feature! Loving it! I really like it, its new and different. As my blog & email subscribers go up, my users & views go down! How are the subscribers counted as far as users & views? So I will get new insight the best time for me to publish a new post. Data is beautiful, and this is a non-invasive addition. The beep bop boop page was just too drastic without any real acclamation time. I did not particularly dislike it, but the shift was too fast, imho. While I am putting in some feeback…ever since that beep bop boop page came and went I am not able to hyperlink anything in my posts and have to move all pictures to the place I want them. They will not upload where I put the cursor. Still one thing missing … the link to syndicated readers. Other than that, I can get used to the new, but cannot see any benefit in the new over the old. Looks like change for the sake of change. These stats are great way of giving right info. Especially in case of an art and creativity blog like mine. Yeah! Nice, they will give me warning when I am falling short on posts. I can’t find total number of comments on my blog or the total number of shares. Have these been removed? I would also like to see average daily/monthly views. Brilliant. Now I need yet another click to see information that used to be visible all on the same page. While I like the most popular day and time feature, the extra clicks and page loading time will ensure I never bother to view it. And all the graph does is show me when I posted. What’s the use of that? I know when I posted. While this change adds one useful piece of information, it makes yet more old information more complicated to access. I’ll be sticking with the old stats page, thank you. I love the new insights! Thanks for your feedback. The feature you’re looking for is still there. From the “Posts & Pages” module on any of the Day, Week, Month or Year pages, just click on the post title. 1. I don’t have large volumes of traffic nor do I post very often. Defaulting to Insights view is therefore unhelpful. Defaulting to Day view would be preferable. 2. The biggest improvement you could make would be for the stats to auto-refresh. 3. Lastly, it would be helpful if I could log out without needing to change pages first. This update is a great news, less confusing but detailed. not sure if I can survive yet ANOTHER new version. Why the fuzz? I still prefer the old version of 5 years ago really. That really was clear and fun. Especially the comparision with how the amount of watchers matched the size of a town somewhere on earth. What happened to that? All these stats are making me itch really. I am not interested in what time or day people are watching or reading. An overview of countries is handy. Weekly, monthly and yearly stats are enough for me. Make it simpler plz. Not more complex. I didn’t realize there was a new page until I read this post – interesting! It might not help much at the moment since my view numbers are still in the lower two-digit section 😀 But it’s interesting to browse throught the stats and I’m sure if you’re more popular it helps you figure out a few things. But, I cannot understand the reason why you deleted the link to the old stats page. Because, I like stats tables in old stats page, very much. But, I’d like you to revive the link in new sats page. I think this new feature is great! This should help the numerically challenged. Oh, and the verbally challenged, too. So, thanks. Yeh. Thanks a lot. Personally I don’t dislike it, but I haven’t appreciated the fact that I can no more see “global” stats (like views of an article from the moment that it has been published or views by countries from the moment my blog exist). I think that adding a “global” page to the “day”, “week”, “month” and “year” sections could be very useful. Thanks for your feedback about an all-time view. You can see all-time counts, recent weeks, and averages by clicking on a post’s title in the “Posts & Pages” module. I still want the Yesterday columns that the old stats page had. Otherwise information I didn’t pick up at the end of the day disappears from view. Put it back, someone! You can view all the information from yesterday by selecting yesterday’s bar in the chart at the top of the page. You can also do that for any bar in the chart. I appreciate the effort to introduce ideas for better blogging but there were perks of the old stats page that I stillused but no longer since you did away with it for the page for the Insights for example the summary of country visited. I like knowing where my readers hail from, if they are decreasing or increasing in a particular country. Could you please, please bring this back, if it is there could you direct me to it because I have poked in all corners. Thank you.